Maybe you’re expecting a baby or shopping for the children you already have. You need to buy a crib mattress, food storage containers and toys. You want to keep your baby’s play spaces comfy and clean. You ought to be able to assume all of these products meet some measure of long-term safety for your baby. Unfortunately, you cannot. You may own a small business that needs to purchase or even resell these items. You simply cannot rely on current safety standards, because in the US, chemical safety policies are woefully behind the science that shows we should be concerned enough to replace some ingredients with safer chemicals. In some cases, individual states have led the way in taking steps like getting Bisphenol A out of baby bottles or banning certain toxic flame retardants from our furniture. But even state-by-state protections for consumers could soon be in jeopardy if the chemical industry’s latest ploy is successful. Some of the nation’s most powerful lobbyists have been working on a thinly veiled “reform” effort that would do little to strengthen product safety while threatening states’ rights to protect their own residents. The jockeying among presidential hopefuls in recent weeks has generated a new round of criticism of what’s called the “Wealth Primary” – the informal, but often decisive vetting of candidates by mega-donors. (The New York Times’s Frank Bruni wrote about it most recently here.) There is something deeply unsettling to voters- regardless of their political affiliation- that the choices about who governs the country are narrowed by a tiny fraction of Americans, with our actual elections – still a year away – potentially reduced to an exercise in Kabuki Theater for the masses. Unfortunately, the wealth primary has a legislative analog. Through all the tools of modern political influence, corporations can now so constrain the choices made by Congress upfront that the formal process is reduced to an afterthought. This is happening right now on the issue of chemical safety reform. Over the last two months, the chemical industry’s leading trade association has conducted what amounts to a massive political “PSYOP” targeting Senate Democrats. The goal is to round up enough Democratic co-sponsors for chemical reform legislation sponsored by Senator Vitter (R-LA) as to virtually guarantee that the bill can pass without making additional changes and make the formal process of committee hearings and amendments politically moot. A deadline has been set for Monday (March 9). Cal Dooley, the president of the association, openly boasted to the New York Times on Saturday that the bill will have 70 votes even before it is introduced. What would this mean for the proposed legislation? Admittedly, Senator Vitter and his Democratic colleagueTom Udall (NM) have made changes in the draft bill that address some major points of the critique made by organizations like mine (a coalition of 450 public health, environmental, labor and small business groups). It is much improved over last year’s bill. But the remaining problems are huge and an important part of the lobbying pitch from the industry is: YOU (Senator) have to sign on NOW, because WE (chemical companies) will not make any more changes! Coming on the heels of unprecedented election spending by the industry, the pitch amounts to a loyalty test and it may be working. So what would this loyalty test leave on the cutting room floor? The first item is states’ ability to protect their citizens from toxic chemicals. The bill blocks states from taking new action on a toxic chemical simply because EPA has put the chemical on its “to review” list. Actual health protections from the EPA would be up to 7 years away, more if the regulated company sued, which it would now have every incentive to do. States have generally led the way on many chemicals, so this is a big deal. The bill also bans states from enacting and enforcing limits that are identical to federal rules. Most enforcement of federal environmental statutes actually occurs at the state level. The provision is a blatant attempt to reduce enforcement. The bill also has two paths for chemicals. Under one, a chemical is measured against a safety standard. In the other, it gets a hall pass where EPA blesses it as safe for any and all uses based on a finding that it is “likely to” meet the safety standard. The major decisions in the first path can be reviewed by a court. Conspicuously, the hall pass– something that industry is “likely to” covet – cannot. Finally, there are some tricky rollbacks in the bill that get at the heart of the question: is there a toxic chemical in couch/baby bottle/kiddie blanket? The bill adds a new provision requiring EPA to jump through a new hoop if they want to restrict an unsafe chemical in a product. Why? It also makes it a little harder for EPA to intercept imported products containing an unsafe chemical. Why? Isn’t making that kind of thing easier for EPA what reform is supposed to be all about? Health advocates are prepared to make all of these arguments going forward, but because of the chemical industry litmus test, they could be rendered moot. On Friday, California’s Attorney General released a letter on the bill prepared by their career staff- some of the most long-standing experts in the world on environmental enforcement. It contained an authoritative and constructive critique that they prepared within 48 hours of having the draft. Yet I’m struck by the number of Senate offices- including thoughtful, wonderful people- who’ve said that it is already “irrelevant” or “too late.” The chief law enforcement officer for our largest state just doesn’t rate in this critical pre-game because the chemical industry has its loyalty test and they’ve set a deadline. I urge Senators to reject the loyalty test and artificial deadline set by the chemical industry. TSCA reform could be a significant public health achievement. But that will only happen if the process is allowed to play out the way it is supposed to, not reduced to Kabuki Theater by the very industry reform is supposed to regulate. 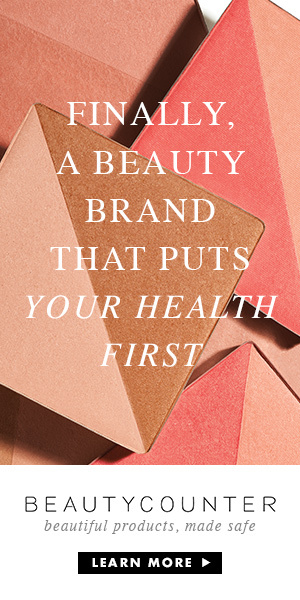 March Forth for Safer Products with Beautycounter!